We've all seen what happens when technology becomes portable and connected to everything around us -- we get fatally bad driving and people walking into water fountains -- but what if your smartphone could be a visor, glasses or even a pair of contact lenses? This is what Google has been researching and no, it's definitely not an April Fool's joke. 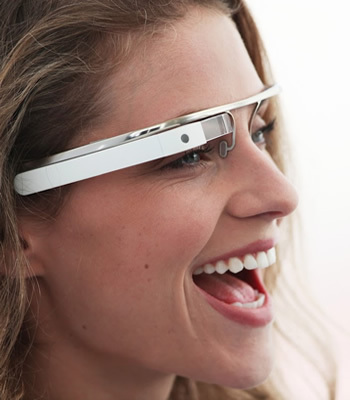 "Project Glass" is a blue-sky project by Google's mysterious research and development arm, Google X. The project aims to augment your everyday experiences by superimposing a layer of visual indicators directly onto your field of vision. The HUD-like apparatus would keep you connected to your friends, provide data about your surroundings and potentially do anything your smartphone can do, but merely at a glance. This visual layer would be fed to your eyes through some device like a visor or contact lenses, giving you translucent alerts, messages, maps and more. These types of projects tend to be hush-hush, top-secret stuff, but Google claims it wants the public's input on what they would like to see with such technology. We think technology should work for you -- to be there when you need it and get out of your way when you don’t. Eerily reminiscent of Caprica's "holoband" emitter, Google's concept of what the final design may look like shows a visor-like device hovering over the brow-lines of people more symmetrical than most. It sounds like science fiction, but there's no reason it has to be a visor though -- and you probably won't have to be a model to wear it. In fact, Project Glass team member Barbak Parviz, has been working on contact lenses which may be able to accomplish the same thing.